This arrived a few days ago, and I managed to restrain myself from opening it until last night. 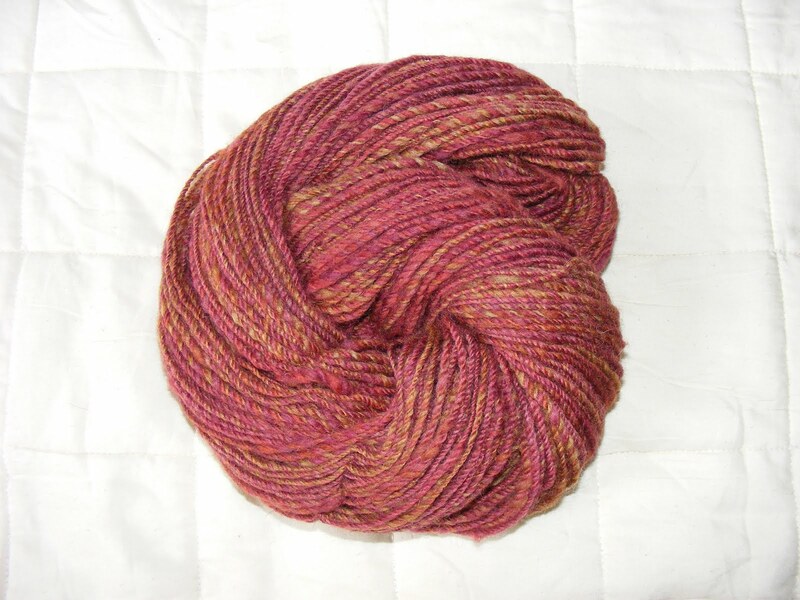 It's my Secret Santa present from the UK Spinners' list on Ravelry, and it's managed to stay completely anonymous! Beautiful colours - very much what I had in mind for my Oak King colourway. I shall have to spin it up soon; it's too lovely to wait. Not as cold outside today, though we did get very chilly walking up at Grassington in the Dales this morning. Beautiful colours in the ice and clear water. This thing has finally been photographed today, before it gets beautifully packaged and off to a Swordfest friend for his wife's Christmas present. It feels beautiful, being about half silk, and the rest camel and fine wool. I'm really pleased with the way the colours shift in and out but fairly subtly. This is the shawl unblocked; it shows the colours more accurately. ... is falling outside and inside now. Tiny snowflakes drifting down the screen. Need to do some more dyeing for Christmas, not to mention take a decent photo of the Holly King fibre - perhaps I might get organised this afternoon, but the computer at home was playing up yesterday afternoon; it took my computer man an hour to get it sorted (which he very kindly lets me pay in costume!) and it was stillrunning slow this morning when I attempted to check snow and travel before leaving at 6.30). It seems to be warming up outside - I can see droplets of water, sun shining through, like streaks of fire dripping of the house next door. Isn't it funny how two forms of fibre that are exactly the same colour photograph differently? 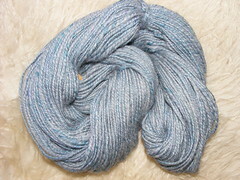 This is a new colourway that I've just produced for the next, Christmas, Fibreholics round. I've called it 'The Holly King'. I shall drop the bag of 26 little 20g packs off with Carole at the Knit& Stitch show in Harrogate tomorrow, weather permitting. 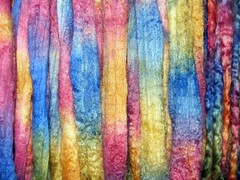 Will be listing all sorts of stuff - handdyed, handspun, sock stuff, and various bits and pieces. Want new winter tyres on the Van. 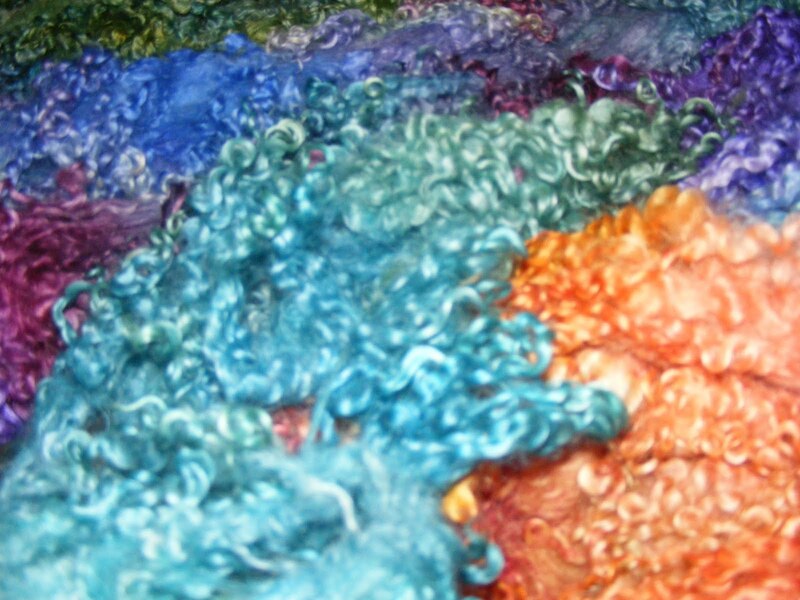 Various fibres, various colours. The very dark shetland with silk streaked through is new. There's a bit of merino with silk and BFL with silk too. Lots of the Copper colourway - I love it. ... bit of dyeing done for a commission. In the front is merino/silk in Blackberry, the darker colour at the back is also Blackberry but over BFL. There is also some Paeony over both BFL and my whitefaced woodland sock yarn. Not a good photo, but it's still hanging up to dry. And this is what they're looking like so far. Had to play with stitch counts a few times. The knuckle end is rolled at the moment - a facing will be picked up, knitted and stitched down. Same for the elbow end. 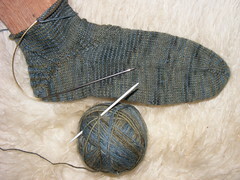 And the thumbhold - just a slit at the moment, the only bit of flat knitting, will be faced. I think I'll use the gold yarn for this. But I love how the warm leaves practically vibrate against the duller green. ... is being updated gradually over the next few days. Has anyone worked out how to get the new Flickr photo page to upload directly without having to download to a computer and then upload to blogs from that? It's driving me crackers and I'm sure I shouldn't have to do that. 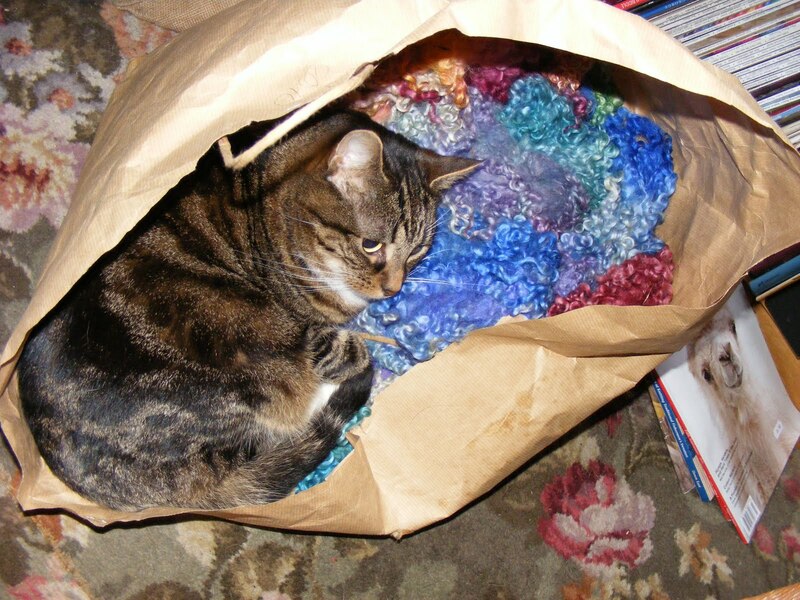 And this is what all that sock yarn has turned into! I'm just about to bring the rest of my fibre and yarn downstairs and pack a few clothes, then I'm ready for when Mark comes back from work in the morning. He'll help me pack the van, then I'm off to work until the post arrives and then I'll set off for Stirling. As I'm setting off from Leeds rather than home, I shall track straight North on to the A1 then hack across the A66, so it will be rather different scenically than my usual drive north. Let's hope I have a successful time; I'm slightly worried as it's rather a knitters' gathering thana spinners', but there seem to be lots of spinning persons there. Fingers crossed. And I plan a visit to Stirling castle if I get up in time tomorrow. There's rather a lot here. I always forget how long it takes me to tidy each skein up, wind up neatly, and attach a label. And there's a sweater's worth of aran yarn in Twilight and another sweater's worth of chunky in Baranduin. Normally I break up smaller lots of yarn that I occasionally carry (I usually only have sock yarn in stock) into various colours, but this time I thought I may as well dye them up into a whole sweater's worth. Let's just hope people like them. I did the aran in Twilight because people seem to be going potty for purple at the moment. Roll on next week and Stirling at the end of it. 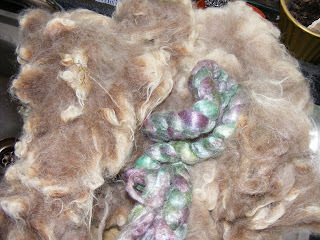 This is tussah silk, baby camel and silk, and kid mohair, all dyed in Flora. Sock yarn this time, I have an order for 500 of my new British Merino sock yarn in Flora, so I did a full oven-load of 900g yesterday afternoon on getting back from Guild and it's dry already. 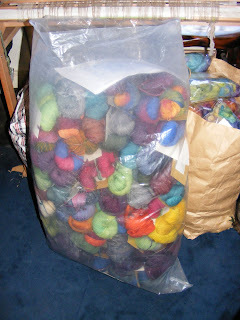 The remainder will go up to Stirling with me, along with lots more yarn and more fibre. There's some more of that hanging up drying/dried, but I've learned from experience that it doesn't photograph well on the drying frame. And I have also now learned from experienced that my sodding Cat can destroy fibre even more than I already knew. 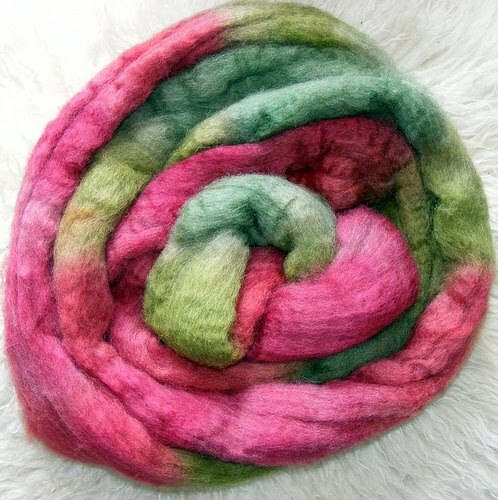 I had a 100g piece of white BFL dyed in Pink out on my bed, having photographed - it was a special order and I wanted to send a photo to the client before askign them for money. Luckily I'd dyed 300g for a 200g order, as by the time Tid had rolled and chewed and sucked and kneaked most of the length of the fibre was pretty solid. Buggrit. Trying to clear the decks a bit before I go away for the weekend, (not to mention find space to pile stuff I'm taking) I washed the last two fleeces from Woolfest last night: a Teeswater and a rather large WensleydaleXMerino. The latter could probably have done with being done in four parts rather than two, but really I just wanted it clean enough to put away. They are now up on the drying rack (aka the thing for bashing Mark on the head, aka a Discovery dog rack!) smelling of wet and clean sheep. There's also a chunk of kid mohair fleece up there, nearly dry - in fact, I've done what I normally try to avoid, which is having fleeces of the same colour drying at the same time. I'm being careful not to confuse the fine Teeswater with the mohair. I still have a Romney shearling, a Romney Ram, and a Polled Dorset ram to wash, but I think they'll have to wait til next week. The latter ram will be fun to spin - the staple is only about 2 to 3" long, but beautifully structured and crimply, and very soft. I shall handcard this (there's a lot of it!) and it will make the most incredibly stretchy, bouncy yarn. Boing. The Romney ram is much longer, about 8" I think, and will comb into a long, silky top. I'd dyed up a bit more of the coloured BFL in Safflower, a couple of commissions (Murex in camel/silk, a couple of other colours in this), and they've all been packaged, along with about a kilo of Clun fleeced I've dyed up and bagged. I don't know how well that will sell this weekend, but I always take my 'shop' up to Alston Hall for our weekend away, and even though it's always just after Woolfest I do well. While I was washing fleeces I thought I'd do a bit of fibre prep too. This is a handful of three fleeces I garnered while at Denise's on Saturday, helping to shear her sheep. I managed to restrain myself from actually bringing a whole fleece home, but I grabbed bit of the brown because it was pretty and nice quality, the darker grey was from a fleece that was largely discarded because of quality (and the tiny beginnings of fly strike - ick! ), and the little bit of very dark brown at the bottom was from the fleece that Mark actually sheared himself. (See my other blog). I quickly ran the wool through my hand combs, which got rid of well over half the fibre. I'm intending to make Mark a hat, so I won't need that much, and there were lots of short bits and rubbish in there. The tiny bit of black fleece was 2" long or less, but combing it (carefully) was worth it to remove the realy rubbish. There was a lot of colour variation in the grey wool. This is Lunil's undercoat, a bit from last year and a bit from this. I never manage to save that much as I have to remember to brush it out in a very narrow window - while just the undercoat is shedding so it's not contaminated by her much longer and coarser guard hairs, and before it starts to matt. It's very soft and fine, and it's had a quick wash too. And this is what I ended up with after I'd blended it on the drumcarder. I wanted two distinct colours, so I added Lunil's fluff to the brown to make it paler, and put all the darker colours together - this one feels particularly silky. 96g in total. 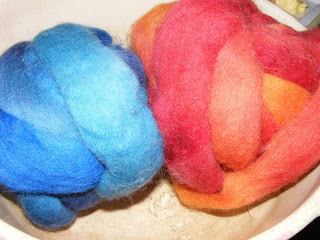 This is some fleece that I dyed last week, vaguely thinking about a bit of yarn based on Red Riding Hood! Both colours were left over from previous dyeing batches, the green from a recipe gone wrong with the main dyeing before Woolfest, and the red left over when I dyed the finishing yarn for the Mystery Thing which I must finish tonight! I didn't bother combing the fleece before it went through the carder, so it's not quite as 'silky' as it could be. I added about 10% of a very soft sparkley stuff I have, pink to the red/purpley wool and green to the green, as well as about the same amount of Lunil fluff. I mean, if Lunil's eyes were yellow and her ears a little smaller, she'd be indistinguisable from a wolf anyway. ... on coloured Bluefaced Leicester fibre. I spindle spun this into three equal parts at Woolfest, wound each spindle's full onto a little ball of screwed up paper, and plied them all together last week, when I got back. So, somewhat rashly, I have decided to participate in this year's Tour de Fleece on Ravelry, joining Team Tale Spinners. As if I don't already have enough to do. 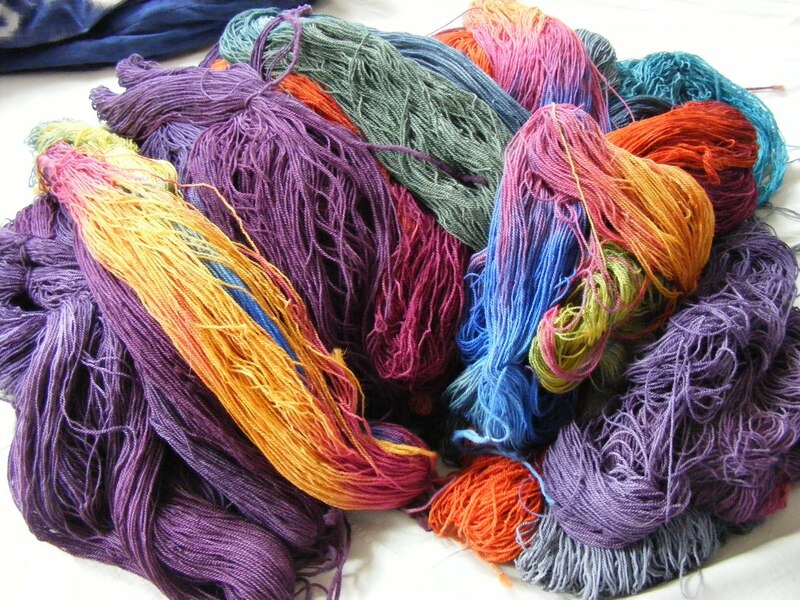 There is extra dyeing being done for next weekend, at Alston Hall, but I shall blog those colours and fibres when all is dry. In the background is 150g of one of the fleeces I picked up at Wonderwool this year, a Shetland/Corriedale/Romney cross in lovely creams and caramels. Soft but still crisp and characterful. 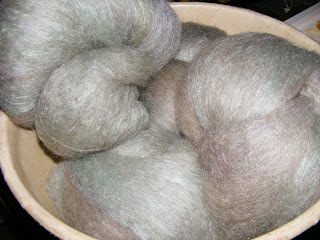 The silk is a Fyberspates tussah that Mark bought for me two years ago at Woolfest, 50g. I passed the fleece through once, then passed it through the Hedgehog twice more with the silk, making four batts totalling 200g. Then another one. 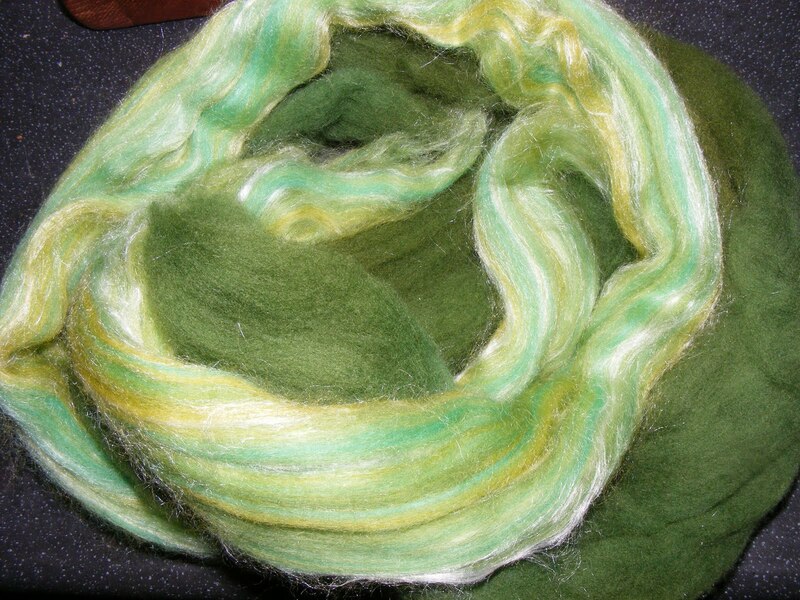 The darker green is Falklands roving from Amanda Hannaford, bought at this year's Wonderwool. It felt a bit 'overhandled' but given that it's roving rather than tops, it was probably much easier to overhandle while dyeing. Gorgeous green though. The shinier stuff is a merino/silk blend I picked up from Denise/Willo Alpacas at Woolfest, specifically to mix with this stuff. So I blended this is more or less equal quantities, only putting it through three times to leave it slightly underblended which I think makes a more interesting yarn. These have been hanging around for a while. Cheviot fleece, the Redleaf is one of my standard colours, the blue I don't think I kept the recipe for. This particular combination of colours justs says September to me. I've been planning these for colourwork socks for ages now, I love Cheviot for socks. 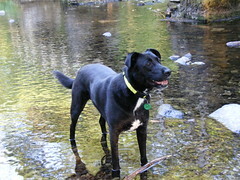 Well, it was a long, hot weekend - we've had rain and thunderstorms before, so I shouldn't complain - but what fun! We saw lots of people we know and met even more lovely people for the first time. There was nearly a fiasco with the tables on Thursday's setting up day. We'd left home very early, got to Cockermouth about 11, put the tent up and unpacked, and then waited for tables to arrive. And waited. It turned out that the company providing the vast amounts of sturdy trestle tables that most of the stallholders rely on thought they were needed by 9am on Friday morning - oops! Luckily someone from the Woolclip thought to ring and check, and they started arriving from about 4pm. So Mark grabbed two for us, then whizzed round and helped various other people to tables too. I unpacked our stall, arranged it in vaguely decorative fashion, then Mark and I took the lovely Denise out to the Mill Inn at Mungrisdale for dinner, which was much needed by then. We've been going there, on and off, for years - it's always excellent. And dog-friendly too, so the pups lay in heaps on the floor and didn't phase the waiting staff at all. You can rather see that colour is my strong point! 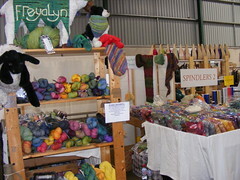 I found an odd comment on a photo of my stall at Wonderwool this year, that someone had posted on Flickr. Something along the lines of the brown tape, and how unprofessional it looked, and how careless it was to use it. Which rather misses the point of these events. 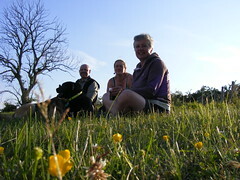 On Friday evening Mark and Denise and I sat up on the bank behind the auctino mart and enjoyed the beautiful evening. Our tent is the blue one below us. 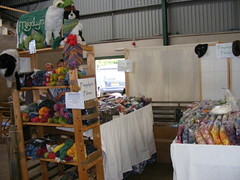 We've been doing Woolfest since its beginning, and I still haven't managed to explore Cockermouth. I know the Eastern Lakes well, but whenever we do Woolfest it's always straight up here and then straight home. I must somehow manage to take longer and stay around soon. We charged off at speed on Saturday night - we were packed up, fed (in the canteen which does really good, basic food - pie and chips and salad for me!) and off by about 6.30. 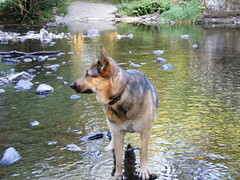 So we drove down the scenic way through St John's Vale, Grasmere, and Ambleside, and stopped to let the pups cool their feet. They have been so good this weekend - they spent most of Friday and Saturday in the big crate in the shade of the tent or the van, and the evenings monstering on the bank. They've since been zonked for the two days we've been home. Frighteningly, I seem to be pretty much up to speed for Woolfest, which has never happened before more than day beforehand. I have a small amount of fibre to pack, label and price, and my new sock yarn to do the same, and then a few orders which I must bag and write names on so people can collect them easily. But yes, I think I'm there. 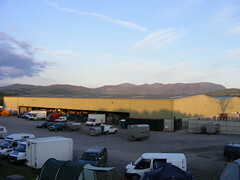 We're collecting the van on Wednesday evening, probably loading most stuff up that night, and setting off first thing thursday morning, aiming to get to Cockermouth by lunchtime. That gives us lots of time to get the tent and assorted camping impedimential set up and the stall all finished in plenty of time to let us have a relaxed evening. Um - it could all go wrong. A Twist Collective sock I had on the go last week, that's had to go into abeyance when I suddenly realised that my mystery shawl had to be finished by the Alston Hall weekend on 10/11 July. That was train knitting last week and it's grown nicely - this sock will, I think, be stuck like this for a while. I love how the colours are spiralling round. 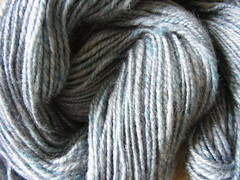 Quick bit of handspun from the batts in the last posting. 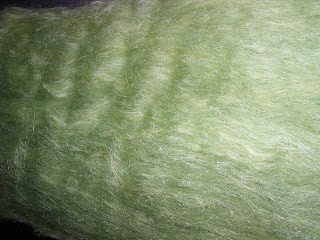 Just a nice structured 2-ply - the fibre is very soft. Shiny too, and I managed not to make the colours too smoothly blended - there's streaks of various blues, the odd bit ofpurple, and some bits are more silky than others. 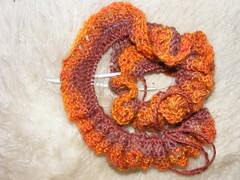 And this is the first scarf to come to my from the Travelling Handspun Scarf Exchange that I'm participating on Ravery. Must get it off tomorrow. The reddish part is mine - the next one should be imminent so I need to get this on its way.